While Venezuelan's in Panama are rallying in support of Juan Guaidó the country’s self-declared new “president” and demanding the ousting of Nicolás Maduro protestors in London gathered at the Bank of England calling for the return of gold deposits to the current regime. With cries of "Do not make war on Venezuela! 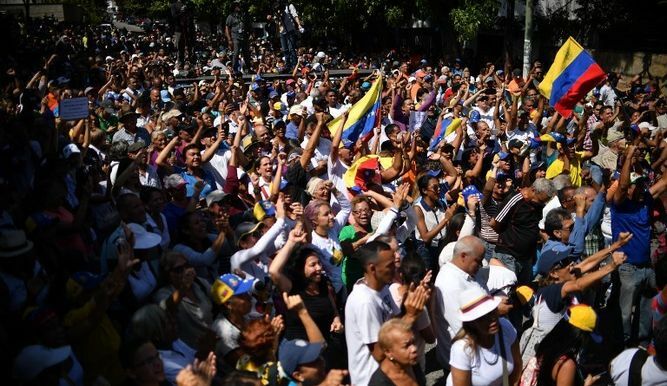 ", Dozens of demonstrators, overwhelmingly British, demanded on Thursday, February 7 the return of the old that Caracas deposited there reports the AFP News Agency. In front if before the headquarters of the central bank, which at that time was holding held its monetary policy meeting. They chanted: “ "Bank of England, return the gold to Venezuela! ", as a demonstrator, characterized as US President Donald Trump, caressed two false gold bars under a large Venezuelan flag. "The Maduro government is a legitimate government, was elected and is recognized by most countries in the world," Robert Miller, 50, who works for a charitable organization, told AFP. And if it's about defending human rights, "why does not the Bank of England take the gold from Saudi Arabia or another country?" He said. "A financial institution cannot determine who carries out repression and who does not," he added. "The gold belongs to the Venezuelan people," said indignant Dominic Hale, a 32-year-old social worker, while his partner Danielle Veal, 30, denounced the pressure exerted by the United States, "openly interested in Venezuela's oil." The Venezuelan executive has been trying for several months to repatriate the international reserves of gold deposited in London. According to a report published by Natixis, Venezuela currently has at the Bank of England about 31 tons of gold worth $1,3 billion. The Venezuelan opposition Juan Guaidó has been recognized as interim president of Venezuela by some 40 countries, wrote in January to British Prime Minister Theresa May asking that the Bank of England not return the gold to the Maduro regime. Questioned Interrogated by AFP, the Bank of England, independent of the government, did not want to confirm whether it made a decision on the matter. But he stressed that "before making any transaction, the Bank must be sure that the requesting entity has the necessary authorizations to require the operation, that all relevant sanctions are respected and that there is no evidence that the transaction will involve an activity criminal". make war on Venezuela! ", Dozens of demonstrators, overwhelmingly British, demanded the Bank of England on Thursday in London to deliver to Nicolás Maduro's regime the gold that Caracas has deposited there. "Bank of England, we have told you, return the gold to Venezuela! ", They shouted as a demonstrator, characterized as the US President Donald Trump, caressed two false gold bars under a large flag of Venezuela. "The Maduro government is a legitimate government, was elected and is recognized by most countries in the world," Robert Miller, 50, who works for a charitable organization, told AFP. And if it's about defending human rights, "why does not the Bank of England take the gold from Saudi Arabia or another country?" He says. "A financial institution can not determine who carries out repression and who does not," he adds. "The gold belongs to the Venezuelan people," said Dominic Hale, a 32-year-old social worker, while his partner Danielle Veal, 30, denounced the pressure exerted by the United States, "openly interested in Venezuela's oil." The Venezuelan executive has been trying for several months to repatriate the international reserves of gold deposited in London. According to a report published by Natixis, the Latin American country currently has at the Bank of England about 31 tons of gold worth 1,300 million dollars. The Venezuelan opposition leader Juan Guaidó, recognized as interim president of Venezuela by some 40 countries, wrote in January to British Prime Minister Theresa May asking that the Bank of England not return the gold to the Maduro regime. IQuestioned by the AFP , the Bank of England, independent of the government, did not want to confirm whether it made a decision on the matter.But stressed that "before making any transaction, the Bank must be sure that the requesting entity has the necessary authorizations to require the operation, that all relevant sanctions are respected and that there is no evidence that the transaction will involve an activity criminal".